As first in the nation to become a nationally-certified Work Ready Community with ACT in March of 2013, Jasper County crossed another national milestone this week as the first CWRC in the nation to be re-certified. Jasper County had until March of 2015 to meet the higher recertification standards but finished more than four months ahead of schedule. As noted in Jasper County’s CWRC profile online nationally with ACT, re-certification goals call for an increase in volume for the National Career Readiness Certificates (NCRC) for the three categories of emerging, current, and transitioning workers. The original goal of 82 employers that endorsed the NCRC also had to be re-certified by having employers re-affirm their endorsement or have new employers as part of the re-certification goal. Counties in the re-certification mode have an additional elective goal established with ACT. For Jasper County, that involved conducting at least five ACT WorkKeys Job Profiles. 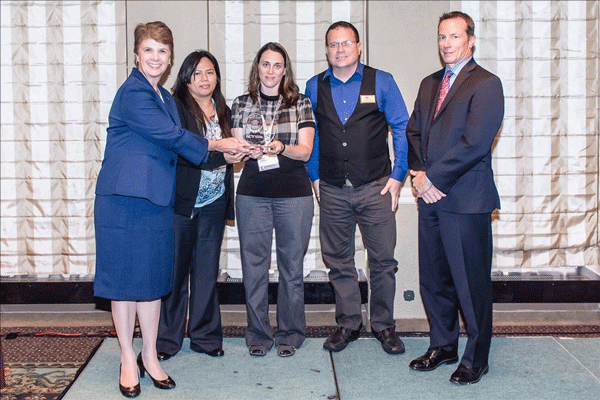 Pictured: Workforce staff supporting Jasper County’s CWRC received a special recognition at ACT’s National Best Practices Symposium for CWRC in October 2014 at St. Louis.